Emily Rasowsky is Customer Experience Lead for Spark Fund and Spark Fund is an organization that helps companies to upgrade energy technology. Emily explains in the very simplest of terms as we welcome her, what it is that her company really does do and how does this really impact a customer’s experience regardless of your business type or industry. Emily shared that Spark Fund and what that actually means, in layman’s terms, our job is to make it as easy as humanly possible for energy managers and financial leaders to update their energy technology. So, things like lights, a jack, chillers, boilers, refrigeration, anything that goes into your space and consumes energy. We work with a lot of large organizations that don’t have the same sorts of incentives or access to resources to upgrade their technology to be energy efficient. And it’s crazy because buildings emit more OCO2 than cars. So, this is a huge problem. And our job, we have an integrated a team of engineers, project managers, and financiers, people who provide everything you would need to do a project. So, we take it off your hands. In essence it really is meant to be a company that makes the experience of owning and operating energy technology no longer an issue because we do this whole process on a subscription. So, we own the technology, people get out of the business of ownership which causes so much heartache and pain and bad experiences. So, we own it and they no longer have to worry about taking care of it. Are you the only type of company that offers this service? Could you share with us a little bit of some of the things that your customers have shared in terms of benefits that they’ve gotten in utilizing the way how your program is set up and structured, both from a financial point of view as well as an emotional point of view, do they feel less stressed, has it improved their productivity? In terms of customer experience innovations and new technologies, is there anything on the brink that Spark Fund is looking to tap into for 2019 or even in the next two to three years that you think will help to revolutionize what you’re doing even more? As a technology company and you are in charge of customer experience do you find that you may hire people who are competent leaders in the technical areas that they’ve been hired to perform in but for some reason they lack that human side. They’re so focused on the technicality of a job, they lack the interpersonal side, and do you find that hinders from that whole framework that you’re trying to achieve? Could you share with us how do you stay motivated every day? What’s the one online resource tool, website or app that you couldn’t absolutely live without in your personal life or your business? Could you share with us what are some of the books that have had the biggest impact on you? What’s one quote or saying that during times of adversity or challenge you revert to this quote to kind of help you to push through on those days that are challenging or seems a bit overbearing? When asked if they are the only type of company that offers this service, Emily stated that right now in the market they’re the only one that’s integrated in all of the unique ways that they are. So, there are certain types of offerings out there that provide, let’s say financing so that you don’t have to worry about finding money for it. There are companies out there that provide general contracting so someone to manage the installation of a new piece of technology. But they are the first that does all of these things together. And they are definitely the first that does it on a subscription contract. So, there’s also things out there that are similar they look kind of similar, but nothing is quite the setup in the same financial structure that we are. Yanique agreed and stated that because when you do it on a subscription basis it makes it more affordable for the organizations because they pay on a month to month basis. Emily agreed. So, the thing that we’re really taking away a lot of financial pain with is when you have a piece of aging technology you never quite know. Even think about even yourself in your home when HVAC unit starts to go you don’t know how much that’s going to cost or what’s going to be wrong with it. We take care of all of that – complete lack of clarity. For example, we have a customer, they’re a school and they had to shut down an entire part of their school district, an entire part of their school facility because the heating wasn’t working. So, we obviously work with them, they don’t have that problem, but you think about all the pain that comes down later down the line. So yes, you’re reducing your maintenance costs, you’re getting energy savings but you’re also reducing these costs that you can’t even forecast for. And some companies that are really sophisticated have a budget for that and some companies don’t have any budget and that hits them somewhat by surprise. So yes, in a lot of ways we are we’re keeping it much more predictable and lower cost which is behavior science tells us when we know what to expect, it feels less painful. Emily stated absolutely. So, the way that we work with our customers is that essentially, they can write this off of their to do list maintaining their equipment, managing their equipment. They don’t have to worry about that anymore. So, what we really boil this down to and what we’ve experienced in the market is our customers are seeing and financially they’re seeing three core benefits that are aggregated into these themes. One is they’re saving money, in most cases we are not pricing in when we share our proposals with them the energy savings they’re going to receive because it’s very hard for us to predict those. And in the air of transparency we don’t want to force them to be tied to those savings which is how a lot of people do that in the market. So, it’s based off a function, they don’t have to worry about is it going to work or not. We guarantee its function, so it always gets fixed and it always has something, you have a support team behind you. So, you’re saving money which is obviously a huge benefit and you’re getting energy savings. But emotionally you’re saving time because now you don’t have to worry. For example, we had one customer who showed us before working with us these are a lot of kind of pre-customers conversations. He said, “How do you know who to call when you’re HVAC unit or your backup generation or your lights they break? Who do you call?”He literally pulled up his phone and goes to his contacts and types in HVAC, eight people who could potentially solve his problem. So, right there you have an overload of information, an overload of choice when all the customer wants, truly, think about getting any renovations on your home, you just want it fixed and you want it fixed well, in a timely manner and in a way where you get clear communication on what’s happening in your space. So, that is one just small example of something that we do. We are a single point of contact that aggregates all of those key players, so you don’t have to figure out who you call in that situation, we are your point of contact and then we take care of all of that back and forth in detail. So, they’re saving time and they’re also reducing the risk because when something breaks that’s often on the risk of the company, they’re actually tracking that financially which we take all of that risk off of their balance sheets literally. So, with schools for example that have certain debt limits right you can’t upgrade a building if you have a debt limit or debt ceiling and how much you can borrow being an institution, we can reduce that risk literally off their balance sheet and we make it because it’s in a subscription you pay like you would for Netflix or Uber or any of those. It’s coming out of your operational budget not your capital budget, so it provides a lot of little flexibility and ease for customers that they’re not getting in other financial models. Yanique stated that she thinks it’s a wonderful idea. And she like the fact that as Emily said it’s aggregated all under one roof and as a customer, I don’t need to contact that person and this person because you are the point of contact and then you take care of everything from there and when you really think about it that’s what people want. They’re willing to pay for convenience and ease of mind and just to know that a responsible organization has this covered, and they can take that as a responsibility off of their plate. Emily stated that what’s interesting she thinks about the ways CX (customer experience) works at Spark Fund is that they are a relatively small startup. They have about 50 people who work for them and when she thinks about what’s happening in the market and the types of technologies people are innovating within. She has two ways that she basically will answer this. One is of course they are investing in technology and in particular in the energy side, monitoring technology because for Sparkfund, they can understand absolutely everything that’s happening in someone’s building without them ever having to pick up the phone. Then they can deploy a maintenance team. They never have to tell them that there’s an issue, they tell the customer, “Hey, we noticed that your machine might need a little tune up. We’re going to send someone out, tell us which day in time works most effectively for you.” That is a tremendous pain point that we can alleviate. And something that is tremendously challenging if you are a segmented organization. So, you have monitoring with one company, and you have maintenance with another, you still need that human to call them from the maintenance to the vendor to connect to those two. So, we are to get off of our customers plate with things like monitoring technology and we’ll only get more and more sophisticated as that technology gets more and more sophisticated. So yes, absolutely we are investing in full structural changes and by the way, that includes creating an entire new platform, a digital platform that our company will maintain and manage that doesn’t give you a crazy chart. So, if you look at with monitoring companies and you’re an energy manager you will get a log in that shows you all sorts of numbers and charts and so much information that some people enjoy but others it’s a lot to take in and when you’re really are just going from one point to another and you’re managing let’s say 900 locations which is not a typical, you just want to make sure everything is running okay, nothing is a big flag you got to take care of that morning. So, we’re literally on top of these technologies building a very seamless, very easy to understand customer platform and portal so those are some tech staff things that we’re investing in but the other side of that is we are really investing a lot of time in and have invested a tremendous amount of time in making our company have some baseline understanding of what it means to really be a CX forward organization and I think that alone is what is driving our innovation. I can’t be in every single product meeting, I can’t be in every single monitoring meeting but we have people on the organization who understand this is where we’re going as a company and they can innovate with this framework of understanding the baseline of behavioral science and how we use it here so this human side is so important and to be honest, one of the biggest challenges she has heard and seen in other organizations is when you don’t have that organizational alignment that really moves things forward. Yanique agreed and stated that everybody has to be aligned, everybody has to be singing the same song. Yanique added, you’ve taken it on from a recruitment aspect which is very important. One of the things that she has been hearing buzzing around in the last six months or so is that technology is great, and it has advantages and disadvantages and as a business owner herself, she finds that technology does help to ease the process, increases efficiency, frees up your time, it just makes you a little bit more productive in your day because there are so many hours and the reality is you can’t be everywhere at every moment but one of the things that she would love push more for 2019 or she’d like to see organizations push more. Technology is important but do you believe that at some point the human element fades or do you think the human element is always going to still be a part of the customer experience because she finds that human beings still want to speak to another human being especially when something goes wrong? Emily agreed with that sentiment and stated that technology is huge but one of the things that is so clear to her is that as a consumer herself and also someone who really truly cares about customer experience journeys is that she thinks we get too caught up in one singular journey and we don’t take a step back and look at all the different journeys that a customer is going through in order to engage with your product. An example with Uber, Uber obviously is a tech platform and they have a tremendous amount of money and resources into building that tech platform. But she thinks the people who are going to win, the customer not just that discrete experience which is one element of technology, but the actual customer are the ones who are going to sit back and think, “Okay, what did the customer have to do to get into the Uber? Where is the customer going when they leave Uber? and how are they going to connect all these experiences together?”And the reality is you do need that human element because she thinks inherently, we are people, we are connected beings, we can’t just interact with our phones all day, every day but there is a lot that supports that sentiment that we need this human connection. So, there is this reality that fusing those two worlds together will lead to the winners, what she thinks is most interesting and she have experience with Spark Fund as well and kind of how they’ve navigated that technology heavy lense. But first start with a bigger picture. So, Amazon obviously has invested a tremendous amount of money in an online platform, but she’s based in DC and they just opened a store, a physical store with actual people who check you out at the front desk and answer your question as you’re walking through and reading the titles of these books. So even though they have this amazing online platform they’re also investing in in-person experiences and she thinks you’re going to see that more and more. She thinks it’s dangerous to do too much in tech and not also think about where the human side is and the Spark Fund, they are a small company, she mentioned this a few times and she thinks it is important to note that a lot of CX out there is focused on these big organizations that have processes and lots of resources to make widgets and all that. For Spark Fund, they experienced this very intimately with their proposal process. They were scoping out what platform that would help their customers have better and more seamless experience. And as they were doing the exploration process, the information gathering, customer conversations, one of the things they realized was their goal is to create trust with their customer and also a seamless pretty easy experience where they get the questions they have get answered right away. In talking with financial leaders and the folks that are actually decision makers on these projects, one of the things they realized was that they don’t need a tech platform, they have a million of these, what they need is a spreadsheet and she doesn’t hire 6 developers to build a really good spreadsheet that they can toggle and understand how to customize based off of the numbers they want to see in front of them so that has created a lot of trust with their customers and helped them ease a lot of pain in the sales cycle. So, you don’t have to always just go to high tech too, she thinks there’s a low-tech version that is accessible for companies no matter how big you are, there are two ways to look at it. Yanique agreed and stated that it’s in the conversations that you have, are you really listening to what they’re saying, are you just trying to sell them something that’s just really out there or are you trying to actually meet that immediate need that they’re indicating that they’re having to you and soothing that pain that they’re feeling. When asked how she stays motivated every day, Emily stated that for her, she is constantly inspired by companies and organizations that she interacts with on a day to day basis who gets the experience right. She is a big fan of this one solid place that’s nearby in DC. called Sweet Green, she’s giving them a them a shout out of course. And she sees that every time, so these small things in her personal life that she seeks out because she genuinely cares about the experience and the companies that she’s going to pay money to, they inspire her. She has an insurance company that she loves, she loves the experience they create, and they have this app that when she opens up the app it shows a picture of her apartment, something so small that inspires her to keep going and keep thinking about how she can apply those things to Spark Fund. Sometimes it’s a challenging industry to be in because people are unpredictable but there are things that are universal and for her it’s those moments of delight when she can speak to a customer and hear how they really alleviated their pain. Recently they created a little Spark Bot, it’s a little robot. It’s this little guy that follows people around and it’s fun for her to think through, “What are the cute little ways that we can delight our customers?”and something so small like that and she gets that inspiration from other companies that she admire but also this idea that we really can make a difference in someone’s day. She experiences it when she gets a salad, you walk out feeling better and happier. So, for her it’s making sure that she is surrounding herself with the right types of companies that she wants to emulate and really have be a part of the whole fabric of this CX program at Spark Fund so it is really external for her and of course she has got an amazing team who is constantly thinking about how we can change stuff and move forward in a more positive direction. It helps to have a very customer forward, customer motivated company. Emily stated that at Spark Fund they are a huge, huge, huge Slack company and so she would say to her if she didn’t have Slack connected with her all the time, she would have missed so much but she also have to say it’s allowed her to have a lot of flexibility in the way that she work because it is something that she can access any point in time and she really loves it. It allows her to be autonomous, work from home if she needs to, work at the office if she needs to and constantly being in contact everybody so she really just like the platform they’ve injected quite a bit of delight into it which is quite fun. And the other thing she’ll say is she knows she has to address some of the personal side as well is Evernote. She is obsessed with Evernote, it is her lifeline, she has everything in there, from her to do list to her grocery shopping to little voice notes that she left to herself and if she did not have Evernote with her all the time she thinks she would be a mess because she would never know where she’s supposed to be or what am she’s supposed to be doing. So, a notes platform, a place where I can jot down ideas and it’s searchable so she can pull up those things that she forgot about, that she thought of last week. Yanique shared that for those of you that are not familiar with Slack, it’s a cloud based a proprietary team collaboration tools and services. So, it’s where everybody gets to connect in the organization and you’re able to track projects and see how things are going throughout the course of the day even if you aren’t physically in the office. Emily agreed and stated that they have a really simple user interface. A lot of community groups that she’s a part of also use Slack. Yanique also shared that Evernote is a note platform and it’s brilliant. And it’s grown so much, they’ve really developed that platform so much that it has way more features than it had 5, 10 years ago. You can take pictures as you said, you can send yourself a voice note, you can do scanning and send it to yourself. Emily stated that she has had Evernote since maybe 2015 and to be able to go back that far in time, she has old notes from things she’d never thought that she would need to resurface but when you search for something and it comes out to the same, it’s been so cool for her to have all that creativeness in one spot. Emily shared that the book that really, truly made CX the thing she wanted to go into was hands down The Power of Habit: Why We Do What We Do in Life and Business by Charles Duhigg. This book when she read it revolutionized the way that she thought about her own life but also her background is in marketing and communication, so she came from a digital background and also in-person previously helping companies try to move to Washington, DC. “So how do you make that experience something super seamless?” And as she was reading this book it not only had so many “aha”moments from her personal life and personal experiences but also because they talk about how you set up habits for yourself and how you create a good space and habit in time for your own personal life but also in marketing and they have some amazing examples in there like the Febreze, she’s not sure if you read this book and if this is going to go too into the weeds but they talk about this whole theory of how people are emotionally attached or they use their senses to drive emotions towards certain things which is a good argument for creating multi-sensory experiences for companies that they’re not just something online to that point earlier. We’ve even talked about having a certain scent, like can we have people come with a certain sort of cologne or perfume when they come to install something to have a consistent experience but that they talk about Febreze and this is one of the most interesting stories anecdotes around CX stuck with her for a while that they couldn’t quite figure out how to get people to adopt this cleaning product, they tried so many different types of messaging, different images, research groups subjects, all of this. And one of the things that they found after many years of this work was that people weren’t necessarily interested or addicted to using a cleaning product but what they were most interested in was that sense of relief and release after they cleaned the space so the smell of Febreze and that “Ha” moment you see it in the commercials now and they were like “mmmm…..Ha”, it was the “Ha” moment that people were looking for. Yanique shared that’s how she feels when she sprays her Febreze. Emily agreed and stated that they nailed it and it’s been a very successful product for them comes in all sorts of scents now. Now you’re never going to be able to un-see it when you look at those commercials, they always end with the big inhale and the sigh out through the mouth, so it’s a relief. 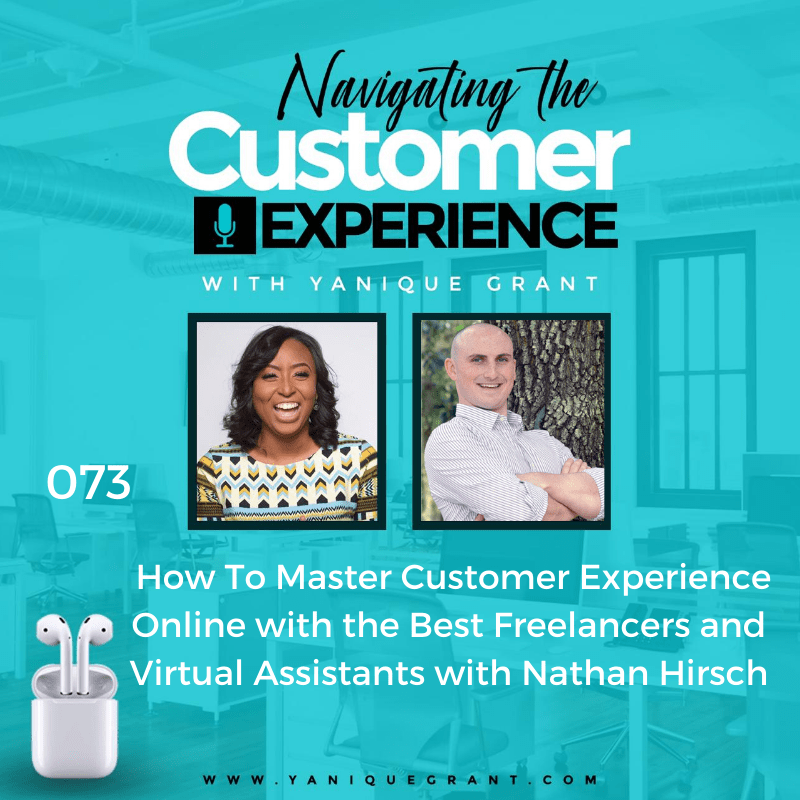 Yanique shared that one of the things that she teaches because she’s a Customer Service Trainer and that’s what inspired her to start this podcast was that customers have two needs and regardless of the industry, you’re in or the product or service that you sell or your ethnicity or whatever your background is. Those two needs are their intellectual needs and their emotional needs. And through the research that she has done, books that she has read, people she has spoken to locally and internationally, people she has trained, it really boils down to how you make people feel and if you can find a way to have your product or your service connect to people emotionally, Febreze clearly figured that out as you said the relief and that’s the emotional component. It will tie them to your brand, and they become so loyal to your brand that now they become your brand advertisers. Emily agreed and stated that she thinks we try to figure out ways to do that most creatively and part of that, our structural changes, how do we create ease in the process of course investing in different technologies like monitoring ease is an entire thing. But to your point earlier there is something really important with the human element and something as small as an installation is happening in your space, can we make sure that our vendors show up with a cup of coffee, “Hey, we brought some coffee for you just to make sure that you’re caffeinated and feeling okay throughout this experience.” And obviously we try to use behavioural science any time we can and finishing really strong is something we care a lot about. So once something is over, and it sounds a little old school, but can we send them like a handwritten note and something that’s thoughtful that makes them understand that we’ve been caring about them throughout this process. Yanique agreed and stated that it’s really the little things as you said handwritten note a while ago. There is an activity that I do in my training sessions is called a gratitude letter and it’s a framework that we created where the participant has to choose an employee in their organization that they’re writing them a letter to tell them thank you for something that they’ve done for them. It could be something work related or something personal and it doesn’t have to be anything big, I’ve had participants come and say they did surgery on their co-worker came to their house and washed their clothes for them or their kid was sick and they gave them some very good tips or it was the beginning of the year and your co-worker brought him a copy of a daily bread and the daily bread has really helped them to overcome some of their personal challenges, but the reason why she thinks the letter has been so impactful to the point of tears, the way how the letter is designed it forces you to pull details out of the experience, it forces you to choose adjectives to describe how it is that this person impacted you and to really show gratitude and appreciate because one of the things she has found generally speaking is that people complain a lot in life but they don’t actually take time to show gratitude and nobody writes letters anymore, it’s all about the tech, so I’m texting you to say, “Hey, thanks a mil,” through WhatsApp or whatever messaging app you use or through an email but I’m not actually handwriting you a letter or a note and it makes a very big difference. Emily agreed and shared that we get more communication feedback responses when we take the time to write something out than we do, when we send out a mass email, so you can’t discount those things. Emily truly believes in the offline experience just as much as the in-person and the more you can create a connection with the organization, the more you’re going to have loyalty and for them, they measure that, they look at how many people are coming back and using them for more or more subscriptions and more different technologies they want to procure so for them it is something that they have honestly invested a lot of their marketing in because it’s very high touch. They are working with big companies and it’s no longer enough just to have one casual conversation, you need to really permeate an entire organization and make an impression. So, she loves that Yanique do those gratitude letters, she feels like she needs to make that a monthly sort of practice. Yanique stated that the gratitude letter is really an amazing activity and every time she does it with an organization over the years, she’s just amazed at how the participants really take it and run with it. She has had one doctor that said the letter meant more to her than her degree as a doctor and she framed it and she put it up in her office because she said nobody has ever done anything like this for her before. So, you’d just be surprised to know, that didn’t take anything, it cost nothing just to sit down and write out how you feel about what the person had done for you that you’re showing appreciation for. Emily shared that what’s interesting about this too is we care so deeply about these sorts of moments that we are finding ways to systematize these things, so it just becomes a no brainer, it’s just a part of our process and for her they use tools to track customers and their emails and their names and all of that. But there is a note section that they are actually working on building out that has personal details there like a customer who has a daughter who recently has this particular interest or is on a soccer team, so we know these things that we can really customize small things like maybe over the holidays we send them a little ornament with a soccer ball something that is seemingly small but really does matter. Emily shared that there’s a lot of different things. She’s very excited because at Spark Fund they are beginning to look very intimately at each of the sales and accounts that they have, their customers intimately. They are really big organizations, they’re working with Fortune 100 companies that have a thousand, couple thousand people who work with them and one of her jobs at this point is to look at those companies and try to understand the people pretty intimately. So, they’re doing things like elevate the sort of customer intelligence and customer experience to make it really personalized. They talk a lot about personalization and technology but what she is talking about here is personalization in relationships and those in-person relationships and she really thinks it will transform the way that their customers look and engage with them. So, things like mapping out the customers and where they sit in the organization, taking those notes and doing it on a customer and organization to organization basis. So, that’s something that they’re working on now and it’s a slightly hybrid approach to CX, it’s definitely not something that she was able to read anywhere that people were doing. So, she’s really excited to figure that out and the other side that she’s most excited about outside of her work with Spark Fund and she also lead a technology, Women in Technology Organization and they’re launching a new set of programming around diversity and inclusion, so how do you get people to feel safe and secure in their environments and they are really tied CX and inclusion. She believes this to her core that if people don’t feel like they are safe or that they can speak up or that they are valid, or points are valid in a company, you’re not going to get really good ideas and you’re certainly not going to be able to connect with different types of customers. You can’t relate with somebody on a different level, then you’re missing out so there’s a huge component of how do you actually internalize safety within a company so that people feel like they are equal and she can connect people who have similar values and similar backgrounds with the customers that they do feel like they have someone who’s rooting for them and understands them deeply within an organization. So, she’s really excited about both of those things and a lot of it goes to this idea of getting really connected with not just one person but multiple people so that you can create that surround sound experience that everyone’s raving about in a company. Emily shared that it’s called Women in Tech Campaign but one of the things that they’re doing is these events that we’re bringing to folks that help people physically reduce their barriers to conversation so people can relate to one another who are different from them and that’s a huge skill and customer service, customer experience especially if you’re getting someone who’s calling and they’re not happy how do you break down those barriers and open that up regardless of background and so that’s really what they’re focused on. And of course, tech is a very broad term, it’s not just developers, it’s people who are using tech like we’re doing now. Yanique agreed that stated because we’re using the podcast to reach out to many different people and share all this amazing information, so yes, technology really does work, it definitely has given her a platform as customer service is something she’s extremely passionate about to reach and connect with people from all different parts of the world. And even though we’re as small as we are here in Jamaica, some of the expectations that our customers have here are no different from the expectations that a customer would have if they were in Paris or if they were in China or if they were in DC., at the at the end of the day we’re all human beings at the core with emotions and we do have certain expectations. Emily agreed and stated that to be fair these big companies Amazon, Google all of them that are international, they are training us all to expect a certain level. And it’s the companies that really take that on and you don’t have to be big, you don’t have to be Amazon to care about it in this way. And like I said we are not an Amazon but we’ve made some strides and investments in making it from the very beginning work and make the experience valuable for customers and she truly believes that the innovators and the disruptors in the market are the ones that are going to look at these tried and true systems and apply a positive experience because as you said at the very beginning, people are willing to pay for that, they’re willing to pay, not a huge premium but a premium for service and it’s not a new concept, think about how airlines are priced, people are willing to pay for business class. And the more you can make that accessible, the more you can have those intermediate tiers, you see them get leverage and use so there’s truth to all that. Emily shared that one the thing that she constantly repeats to herself or when she’s having a moment, it’s not necessarily a quote but it’s almost a reminder, it’s that, “You’ve been through challenge and you always will get to the other side, that this too will pass.” You will have a moment and then it’ll end and it’s a reminder of how she has gotten through things that have been challenging before. So, it’s less of a quote and more of a reminder, our grounding. “Okay, you’ve gone through worse.” And to Yanique’s point about gratitude, she finds in those moments to bring up something that she’s really grateful for even if it’s really hard to do because sometimes it’s really hard. It can just automatically take you to a different space, it’s like things are kind of going awry but it can’t be that bad there are people in this world who don’t have the same privileges and luxuries that she has right now and that’s enough to be grateful for. Yanique agreed and stated that we do need to remind ourselves of that sometimes because we do get caught up in everything that’s going on and we’re complaining, and we’re just frustrated, and things didn’t go the way that we planned but sometimes God has a bigger plan for us and when one door closes another one surely opens. So, we just have to be open for that.